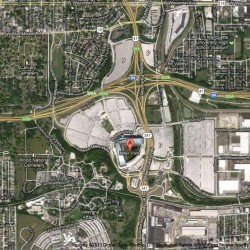 The parking lots at Miller Park could provide an alternative way to expand the freeway through the center of Milwaukee. Freeway could run through Miller Park parking lots. Some Story Hill residents and elected officials are urging the Wisconsin Department of Transportation to use that option for future reconstruction or expansion of east-west I-94 to minimize the freeway’s impact on the neighborhood. This would involve straightening or partially straightening the bend in I-94 where it curves north around the Miller Park parking lots, which are used mostly for 81 home games during the baseball season. Straightening the freeway also could lessen reconstruction / expansion impacts on the Story Hill neighborhood from the proposed double decker freeway. The Milwaukee Brewers referred questions about the proposal to Duckett. A WisDOT official said at a recent Story Hill Neighborhood Association meeting that shifting I-94 to the south could be costly if WisDOT builds freeway bridges through the stadium parking lots to preserve parking spaces underneath them. A parallel situation occurred downtown: Several hundred parking spaces used by county employees were eliminated when the Marquette Interchange was reconstructed. Urban Milwaukee asked WisDOT in an email about the differences between the Marquette and I-94 projects when it comes to the priority given to preserving parking. The agency did not respond to the question. State Sen. Tim Carpenter (D-Milwaukee) who represents the Story Hill neighborhood, said the Brewers and Stadium District should be willing to accommodate freeway construction. “In politics you have to play hardball,” Carpenter said during the Story Hill Neighborhood Association meeting. Miller Park is financed through a sales tax and if the Brewers and Stadium District resist the parking lot option, “we’re just going to have to push for legislation to end that stadium tax and they can pay for it with a ticket tax,” he said. Ald. Michael Murphy, who represents the area, said he believed the parking lot proposal would be “politically overruled by the Walker administration” if it is more costly than other options, even if those are more damaging to the surrounding neighborhoods. “Anything that costs any extra and that might benefit the city is immediately shot down,” he said. Correction: Through an error in editing, an earlier version of this story suggested the alternative route could mean a double decker freeway wouldn’t be needed. That is is incorrect. Gretchen Schuldt is a Story Hill resident who opposes a double decker freeway. I think straightening out this interchange coudl have many positive impacts. Parking under freeway lanes coudl be a boon to fans who want to tailgate when it is raining. MAybe the Brewers could charge more for “covered parking”. In addition to moving part of the interchange away from the Story Hill houses and possibly eliminate the left lane on-ramp problem just west of Miller Park. Although I maintain that a wider freeway really isn’t needed, this is definitely an “intriguing” idea worth studying. It might be a chance to add some nice park land to the bluff, a much wider buffer before the neighborhoods, and maybe they could put the freeway at grade but build a parking structure OVER it? Having geeked out for a bit now on Google maps…. Seems like the cemetary is stil a bottle neck. I dont’ see any way to widen it withough going double decker at that point. But at least that saves Story Hill. Also… doesn’t seem like too big a deal to double deck the area east of the stadium, it’s already down in a ditch so to speak. Tyrell, you’re right, the graveyards are still an issue. Through an error in editing we gave the impression the alternative route would eliminate the need for a double decker freeway, which is not true. The alternative route only lessens the noise and other impacts on Story Hill from a double decker freeway. I have to disagree with Tyrell about widening not being needed. While I’m part of the crowd that insists the city needs to diversify its public transit options rather than incessantly investing in freeways, this is one stretch of freeway in the city that is long overdue for widening. This is apparent when 5 lanes of freeway coming out of the Marquette interchange bottlenecks to 3 lanes in a matter of a half-mile and gets backed up every single day pretty much all afternoon – not just at 9am and 5pm. Its almost sillier than 43N toward GB bottlenecking to 4 lanes by bayshore. In fact, I would argue that the main freeway loop consisting of 94N/S,E/W and 894 that serves Milwaukee’s main urban core should’ve been widened to 8 lanes before we spent the billion+ on widening 94 to the Illinois border to 8 lanes, but that’s just me. Why don’t we just stick two lanes in the old interurban ROY that right now just routes power lines? It already cuts through the cemetaries, and with some imaginative construction at either end could even be in/out swapped depending on time of day! The overwhelming majority of the bottlenecks heading west of Downtown are caused by the atrocious design of the stadium interchange. Have you ever noticed that the same volume of traffic flows fine after it? With the same number of lanes. If they eliminated the left turn lanes & reworked the interchange to be similiar to the Park East rebuild, that would nearly eliminate the huge amount of conflicts/slowdowns/congestion. The straw isn’t too small, it’s just bent. The fact of the existing cemetaries seems to be given little concern, with parking for 81 home games of more importance. You must remember that this affects Wood National Cemetary (north and south of the freeway) and 2 Jewish cemetaries (north of the freeway). Uprooting all of these loved ones (to go where?) seems a poor suggestion, when I have seen some very good options right in these comments. I hope that smarter heads will prevail in the DOT and satisfy the needs of all, including those who cannot speak for themselves anymore. All alternatives currently under consideration for I-94 west of the Stadium Interchange will not take any land from the cemeteries or require the movement of any remains. Before anyone gets anxious about a towering viaduct in that area (not a great idea), note the options to double deck by putting new lanes at a lower grade than the existing freeway. The double decking will almost certainly need to happen if WisDOT ever hopes to improve the operation of the tightly-spaced interchanges. Just modernizing the facility to eliminate left exits/entrances and provide a system of collector/distributor lanes will require the double decking, even without expansion to 8 mainline lanes.